Post-mastectomy bras, beach, and actuve swimwear specially designed for breast form wearers. Microfiber bra has a sleek design. Seamless molded cups conform to the curves of the body and add extra support. Convertible straps can be halter or criss-cross. Seamless molded bra has superb combination of support, shape, and style. Embroidered lace spans the width of the band. Straps can be halter or criss-cross. Seamless molded cups and padded straps. Lace band in contrasting thread color. M-frame design provides excellent support that lifts, shapes and remains comfortable even after long hours. Comfortable cami top is a great alternative to wearing a bra. Wear your breast form with your built in t-shirt bra. Can be worn by itself or under a blouse or jacket. Soft-molded cup bra using breathable spacer fabric. Convertible straps can be worn criss-cross or halter style. Floral lace pattern texture. Soft bra that provides ample support. Extended sizes. Eleglant bra with a higher neckline for optimal coverage and higher side panels. Wide straps. Lightly padded, seamless molded cups. Continuous straps from cup to strap. ABC rose over left breast. Front-closing bra with back adjustment. Comfortable to wear and easy to fit. Delicate lace overlay over molded cups. Cami insert for extra coverage. Basic, high-quality, everyday soft-cup bra with lace trim for added flare. Breathable cotton, soft, stretchy leisure bra made for comfort. Front closure. M-frame design offers long-lasting comfort and great support. Microfiber filled cups makes the bra breathable and cooling. Unique massage fabric. A supportive elastic band. Lightly padded straps. Seamless molded cups have a smooth look under clothes. Seamless molded cups and embroidered accents. Ideal bra for fitted tops and petite fit. Comfortable and easy to fit. Soft-cup shapes and pads the breasts in fiberfill cups. Jacquard design in ABC rose pattern. Three seam full cup has best support for larger sizes. Padded straps for comfort. Seamless molded cup bra enhanced with breathable fabric spacer. Satin strip accents the bottom and center. Pocketed strapless bra works with any breast form. Underwire for gives secure support. Straps are included as an option. Give yourself the perfect silhouette with style. Seamless molded cups give you a sleek, smooth look under clothing. A soft cup that doesn't compromise support. Moisture-wicking, breathable fabric assures dry feeling all the time. Padded shoulder straps. Side panels of powernet fabric. Easy-on bra with ultra-soft molded cups. 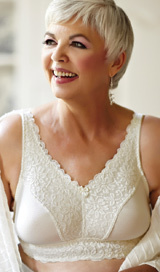 The Original ABC T-Shirt bra which revolutionized the mastectomy bra industry. Get a sleek look under clothing. Padded straps and full coverage.